Ensure that the bathrooms in your school, office, or restaurant are fully stocked from day one with this convenient restroom dispenser kit! Featuring everything needed to stock a restroom, the kit includes toilet tissue, foaming hand soap, and paper towels, as well as the corresponding dispensers. 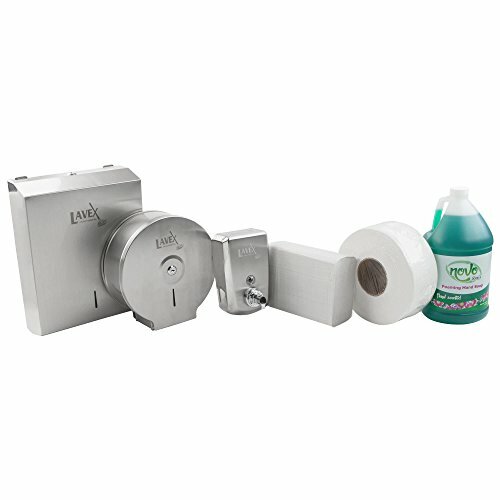 This makes the kit perfect for newly opened restrooms, whether after a renovation or for the very first day of service. Plus, it ensures that the disposables you buy are compatible with your dispensers, so you're not left in a lurch if a piece is selected incorrectly. The kit includes soft and absorbent toilet tissue that's not only septic safe, but great for high volume venues. This TableTop King Janitorial 2-ply jumbo toilet tissue includes a 9" diameter and is compatible with the supplied surface-mount dispenser. Perfect for new and modern restrooms, the TableTop King Janitorial dispenser features a satin finish and comes standard with the appropriate mounting hardware and key. The latter makes reloading easy, as does the viewing slot that shows you when to restock another roll. It accommodates (1) 9" roll at a time.